Nestled between the City and the West End, Clerkenwell is a hive of activity. 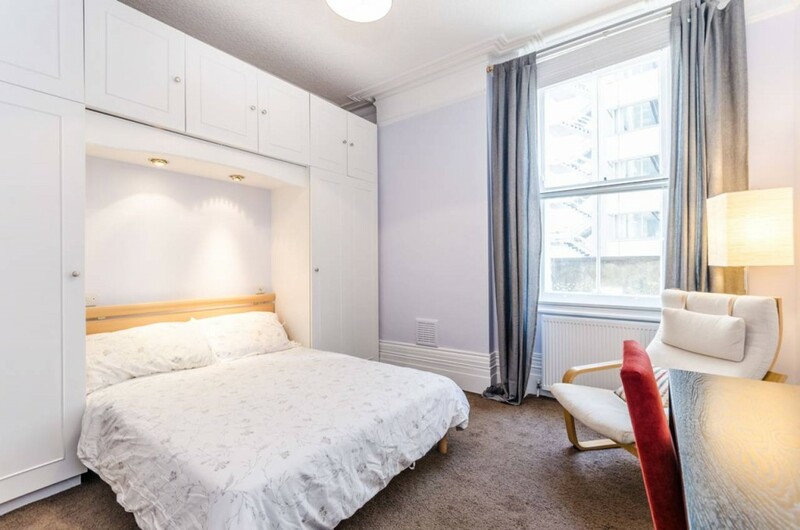 Housing many business and office areas, eclectic eateries, booming pubs and vintage shops, this Clerkenwell apartment rental has something to offer everyone. From the young professional to the rowdy college kids, all different walks of life call this chic area home. This eclectic suburb of London is a prime area to live if you’re a city dweller. Roughly bounded by the tube stations of Farringdon, Barbican, Old Street, Angel, and Kings Cross, Clerkenwell is an incredibly central place to live. You can walk into the City, cycle into Soho or the West End. Also, you could exploit St Pancras International which is only one stop away from Farringdon station. 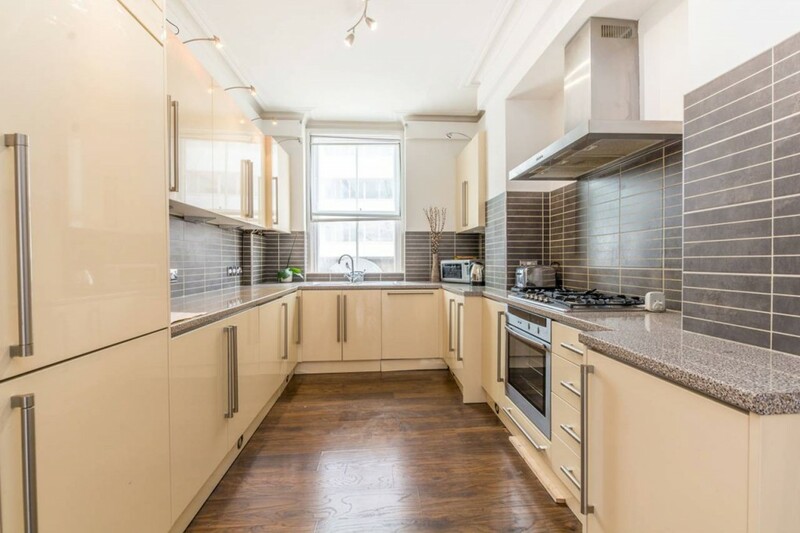 This makes this Clerkenwell apartment rental a prime location and a top-notch area to reside. 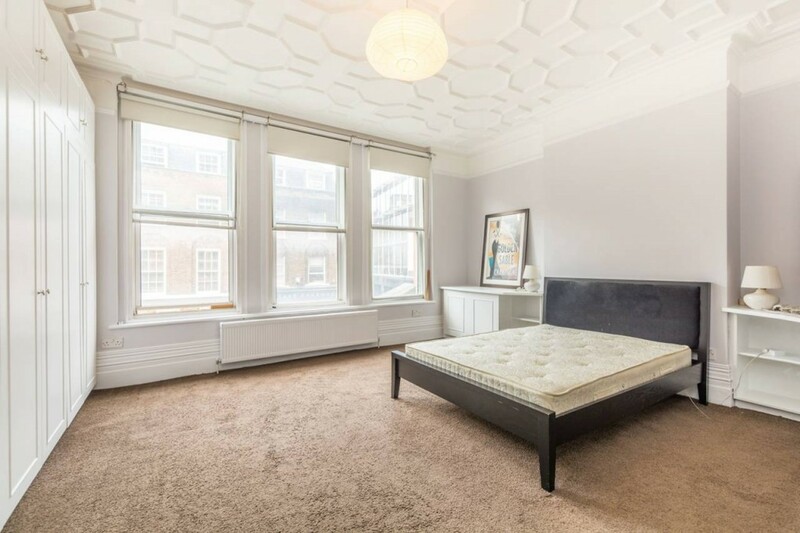 Located on the first floor, this stunning two bedroom Clerkenwell flat rental offers a spacious and modern space to live. This stylish brick building is ideally located on Grays Inn Road, breaths from the fashion-forward amenities of Holborn and Clerkenwell. With this Clerkenwell rental, there are sizable windows in the recreation area. There is gleaming wood flooring throughout, this Clerkenwell apartment rental and it gives off an uplifting and cheery vibe while making you feel right at home. A modern electric fireplace is built into the wall, making for a cozy spot to hang out and get warm in on a chilly London night. 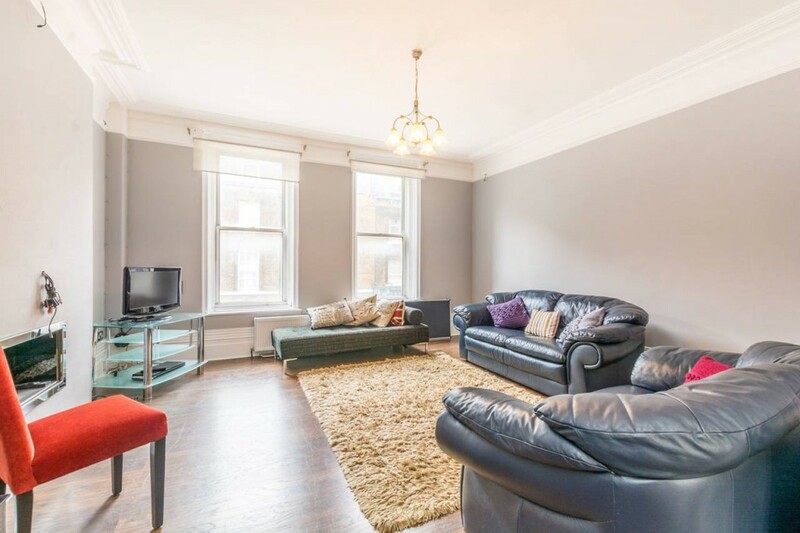 This substantial Clerkenwell apartment rental space offers plenty of room to host guests comfortably, or just to spend some alone time by the fire. The kitchen offers an enormous amount of storage space, and state of the art stainless steel appliances. A textured backsplash keeps up with the contemporary feel of the Clerkenwell rental and allows for plenty of room for all your culinary needs. A large window above the sink provides natural lighting to flow throughout this gleaming kitchen. Both bedrooms are carpeted and house a plethora of wardrobe space for your clothing. The master bedroom is an enormous space, with three bay windows lighting the entire expanse. The second bedroom contains a built-in desk, making it the perfect spot for a study or for a guest to stay. Boasting it’s numerous pubs, clubs, Michelin-starred restaurants, open green spaces and large varieties of shops, this area leaves nothing to be desired. The cultural atmosphere is host to a mix of young professionals, students, and businesses all calling Clerkenwell home, The area around this Clerkenwell apartment rental provides an eclectic combination of every unique individual. Having it all, like exposure to the vast range of amenities the Clerkenwell apartment rental market has to offer has its rewards. Whether you need some outdoor time in one of the tranquil green squares, an after-work cocktail, or a good bite to eat, you won’t find a lack of what you’re looking for in this prime section of London.